It's been one year since the acquisition of RBUK Ltd by Eliza Tinsley. And what a year it has been! 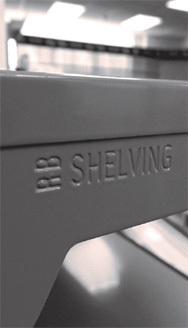 With the launch of the RB Shelving System, a new Sales & Marketing Suite at Head Office in Wednesbury, new products and innovations introduced to the RB range and a great many projects both completed and on the horizon, the first year has been an incredible success! 2018 looks to be even more exciting for RBUK! "It has been a huge effort from the whole team at RBUK and Eliza Tinsley and it has been their hard work and enthusiasm that has made the first year so successful" says Tinkle Jain, Managing Director of RBUK. "We would also like to take this opportunity to thank all of our customers for their amazing support and for embracing the new RBUK. We will continue to provide the excellent service that they have come to expect from us and we look forward to many years of supporting them as they have supported us!" So what lies in store for the next 12 months and beyond? RBUK have plans to combine their EDENSHOP website with a brand new E-Commerce website that will provide their customers with a one stop solution for all their shopfitting needs. They are also developing a new Queue Management System - UNI-Q® which will be able to incorporate many of their existing shopfitting products. The system will continue their ethos of quality at a great price. RBUK also hope to continue adding to their portfolio of customers and enjoy the growth that they have experienced in their first year as part of the Eliza Tinsley group. With that and so much more to look forward to, RBUK has resurfaced as one of the premium suppliers of shopfittings in the UK!